New Restart Me Update for all BlackBerry Smartphones! 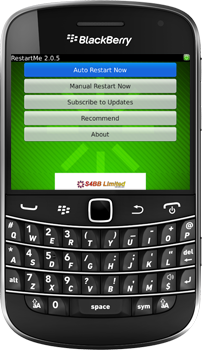 S4BB Limited just released Restart Me 2.0. The all new 2.0 version comes with an eye-catching design and runs now on all operating systems including the new OS 6 and 7. Restart Me is the easiest way to reboot your device, avoiding complicated combinations to restart. And the best part is, Restart Me 2.0 is for FREE! Restarts the device easily with just a click on a button! Avoids complicated combinations to restart device. NEW: OS Update: Works on all recent BlackBerry® devices. Restart Me 2.0 is compatible with all devices running OS 6 and 7 including the new BlackBerry Bold 9900. Previous Previous post: Get information about 270 countries & regions onto your BlackBerry or Android Smartphone!